Did you know that Film.Ca Cinemas CEO Jeff Knoll is a founding member of Halton Green Screens? Or that Film.Ca is donating $10,000 worth of food and refreshments to Earth Day celebrations and cleaning crews in April? You may not even know that you can see Sea of Life with Halton Green Screens at Film.Ca Cinemas on March 28 for just $5 (or $2 for students)! The cast at Film.Ca takes seriously their efforts to reduce waste, recycle and reuse, and constantly look for new solutions to make sure Oakville – and the whole world – can enjoy our galactic home for generations to come. As part of that, Film.Ca is the proud host of Oakville’s showings of Halton Green Screens. The next showing at Film.Ca is on March 28, featuring the film Sea of Life. 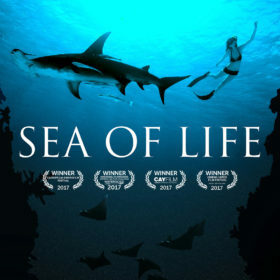 A 2016 documentary written and directed by Julia Barnes, Sea of Life follows the filmmaker on a worldwide journey as she examines global environmental issues facing the ocean and documents the movement that’s working to protect it. Click here to get tickets to this screening. If you’d like to learn more about Halton Green Screens visit their website at HaltonGreenScreens.ca.